Last year we made three trips to Los Angeles in pursuit of, installing, and de-installing Lou’s show at the LA Center for Digital Art, and we did quite a bit of walking around the downtown area near Pershing Square and up to the Museum of Contemporary Art on Grand Avenue. Being a flatlander from Tiny Town, I was intrigued with the skyscrapers which are not just towering blocks of concrete, but rather sculptural structures of glass that mirror the sky and buildings around them. 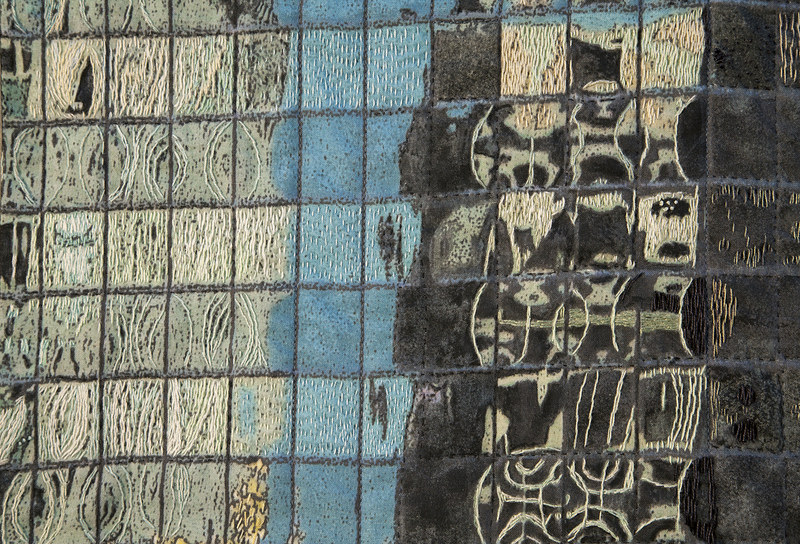 From the sidewalk the windows looked like many little abstract paintings. 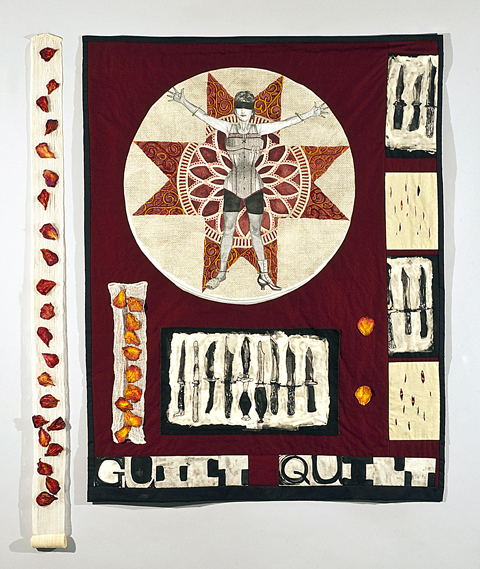 These are my two quilts completed this year, 2015. Many buildings suggest a quilt that consists of pieced strips of fabric with windows contrasting with the gray structural concrete. Here is an image of the curved surface of a building on Grand Avenue in downtown Los Angeles which I had printed on satin so it reflects the light like glass. 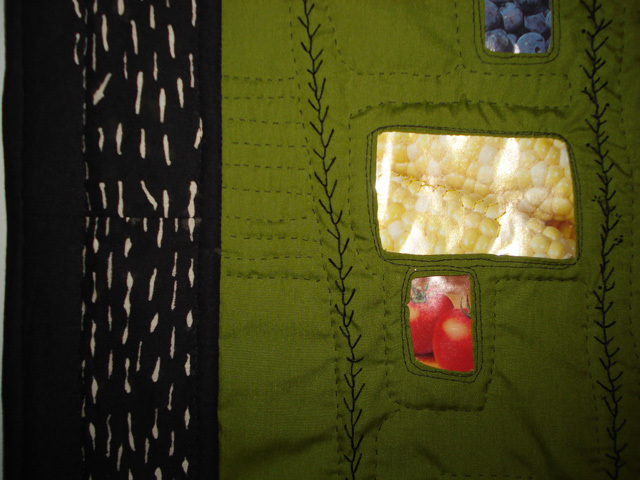 In August, 2014 I finished my quilt for the year. This image is what you would see if you were on a boat on the Chicago River, looking at a fragment of the curved glass façade of 333 Wacker Drive that faces the river. You would see the sky mirrored and the buildings across from it distorted in its grid of windows. 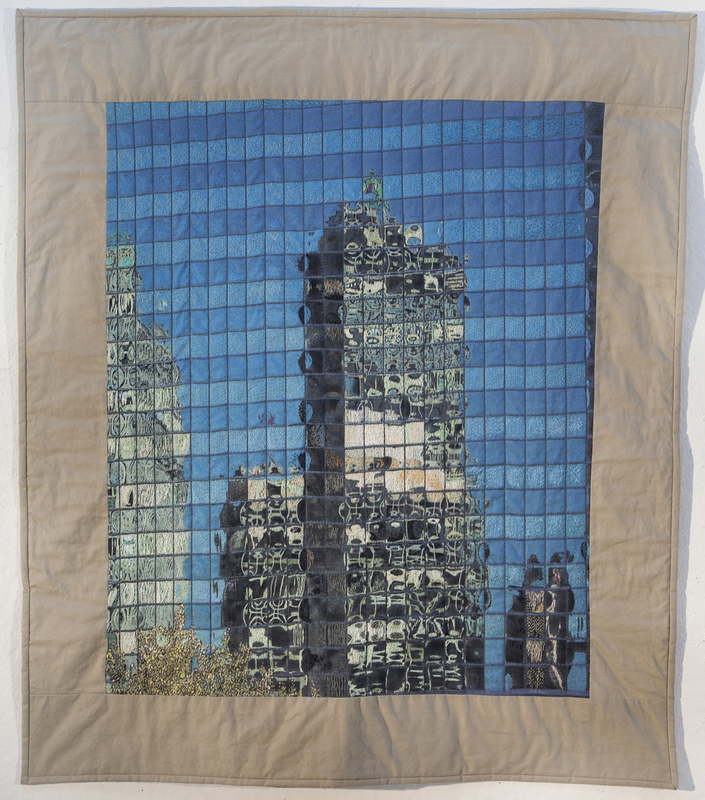 The structure of the skyscraper suggested a quilt to me, with all of the windows forming many little abstract paintings. I took the photo and had it printed by Spoonflower on their Kona® Cotton in March of 2013. 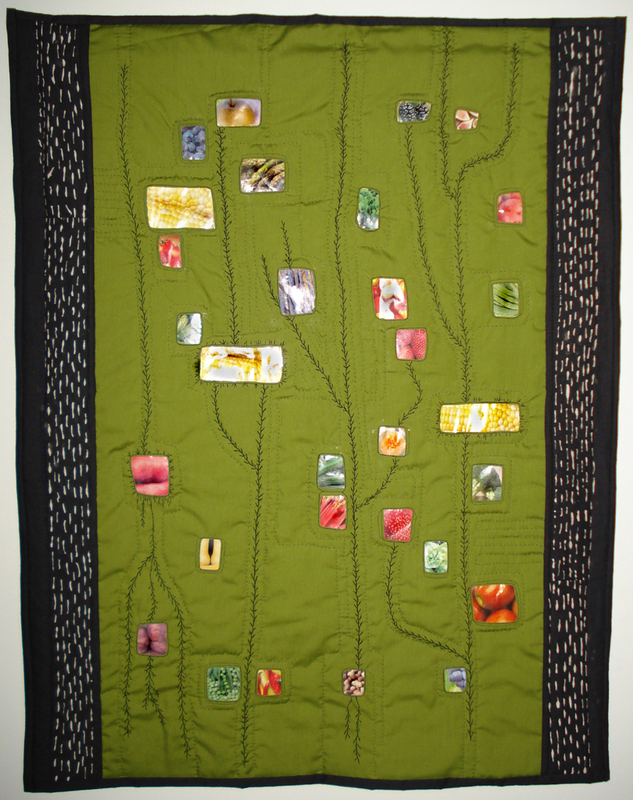 Over the following year-and-a-half I did lots of hand embroidery, followed by machine and hand quilting. In the summer of 2011 I did a drawing of stitch lines made by laying a piece of Asian paper on a plate that had been inked with Daniel Smith water soluble relief ink. 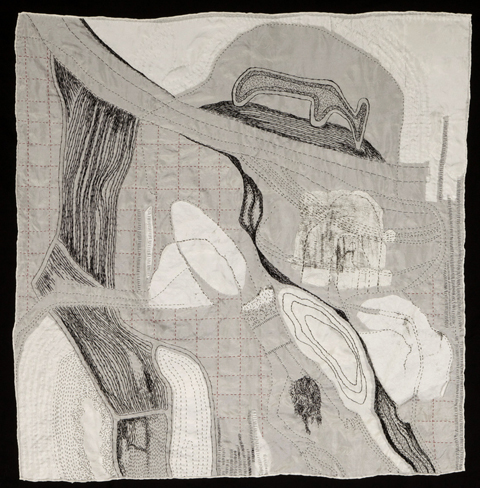 Earlier this year (2012) I began stitching that paper onto a silk handkerchief. 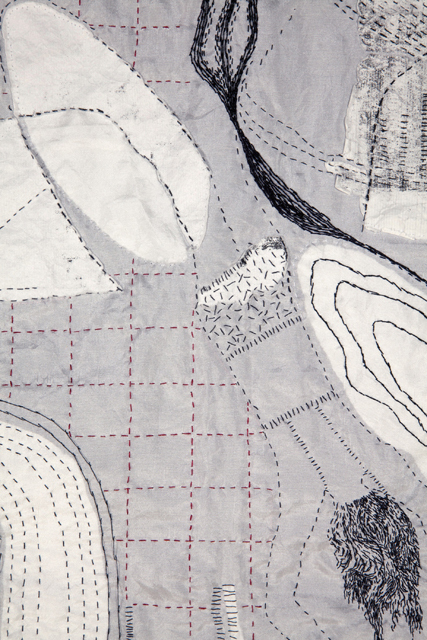 I was essentially creating a quilt, since nowadays quilting refers to the technique of joining at least two fabric layers together by stitches. 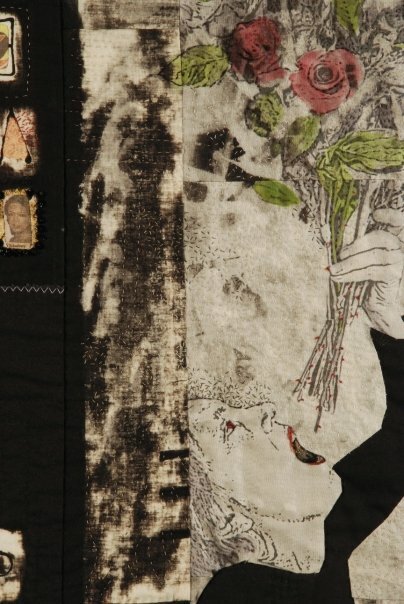 However, to give the piece some substance I layered the paper and silk onto black cotton and made stitches with black quilting thread. I was actually making a quilt! 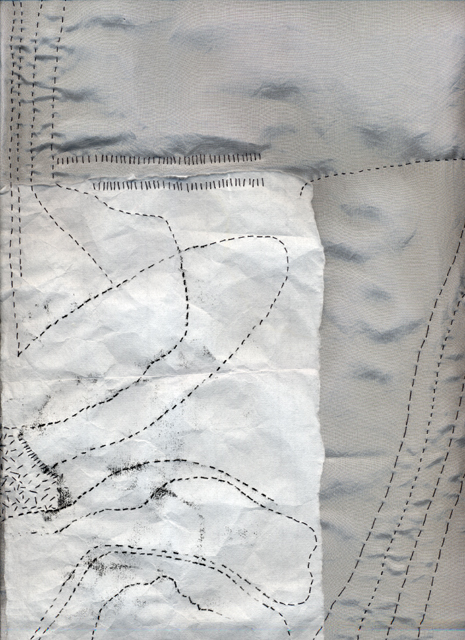 It is so much quicker to make stitches with the stroke of a pen than to go up and down with a needle. With a needle your aim has to be a lot more accurate to make sure the line is going in the direction you want it to go! And then make thousands more. Had this notion that I would hand paint a “whole cloth” using fabric paint so the cloth would be soft. 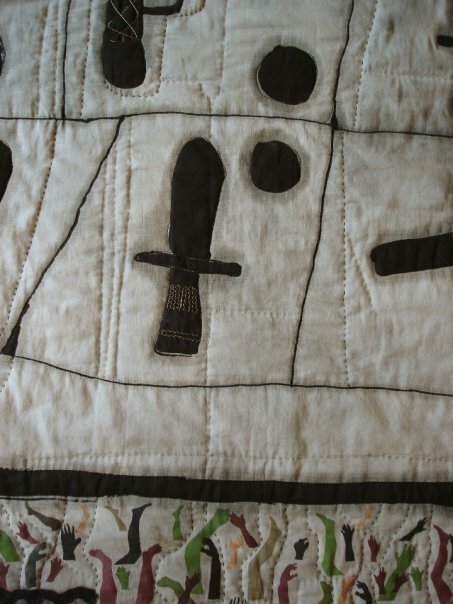 Then I would hand embroider and hand quilt the details. My inspiration was from flying over France and Italy in 2010 on our trip to Florence and from riding in the careening tourist buses over the Tuscan hills of olive groves and vineyards. It takes a long time to grow crops. 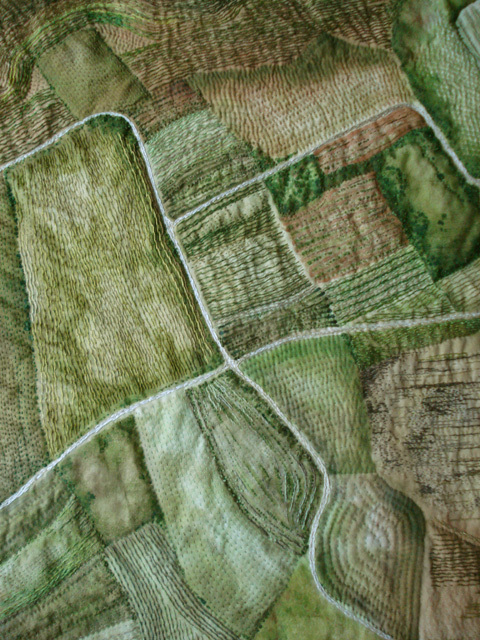 Working on my fields, I can’t help but think of the devastating tsunami in Japan (March 11, 2011). 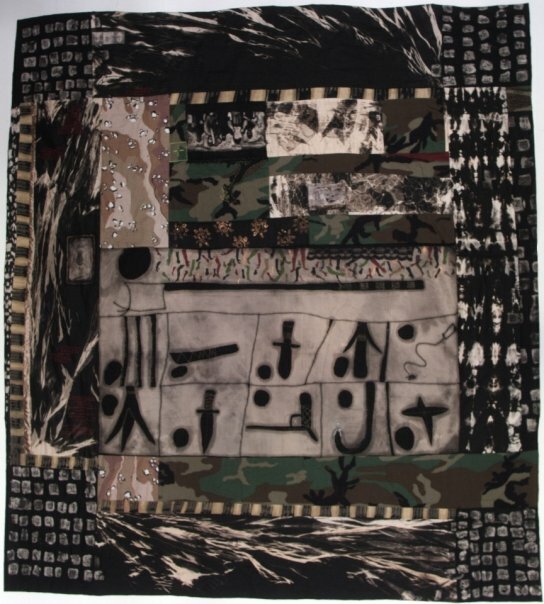 This piece is roughly based on the configuration of the Snellen Eye Chart with rows of symbols and letters that increase in number (yet, in this case, remain the same size). How do we interpret the stimulus to our eyes including the daily barrage of media ads and spam emails proclaiming “Katie Holmes has a Rolex”? (I’m talking 2005 which is now outdated, no longer hot! new! no matter…) We are being made to desire things that are far more exciting or glamorous than the stuff already in our ordinary lives. Test your visual acuity! Can you find the letters/message ? 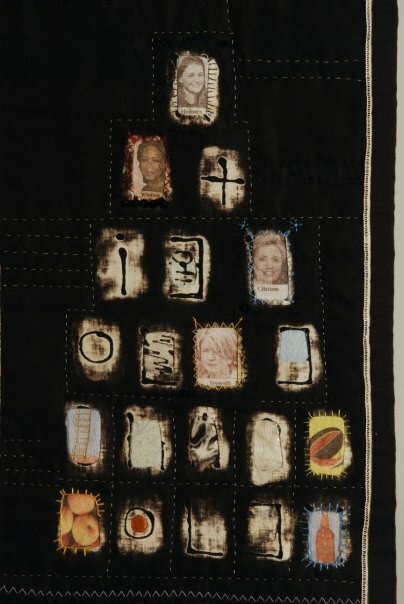 The previous quilt, in addition to containing magazine pictures, also involves drawing with wax (BATIK) on black fabric and then bleaching (DISCHARGE). Here are some more examples of that drawing and bleaching technique . . . 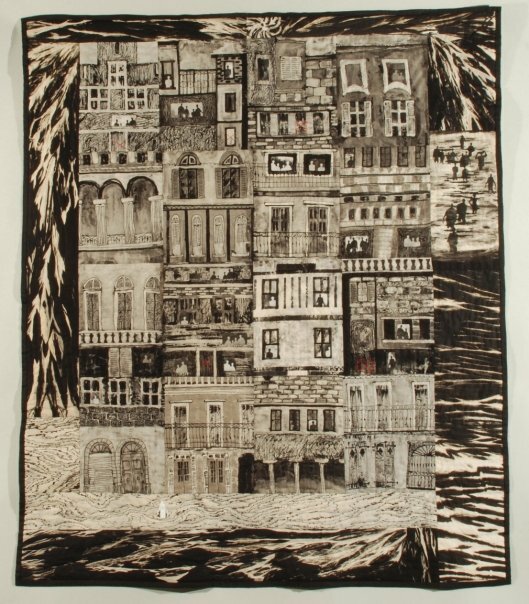 This piece dealt with the devastation of New Orleans as a result of Hurricane Katrina. 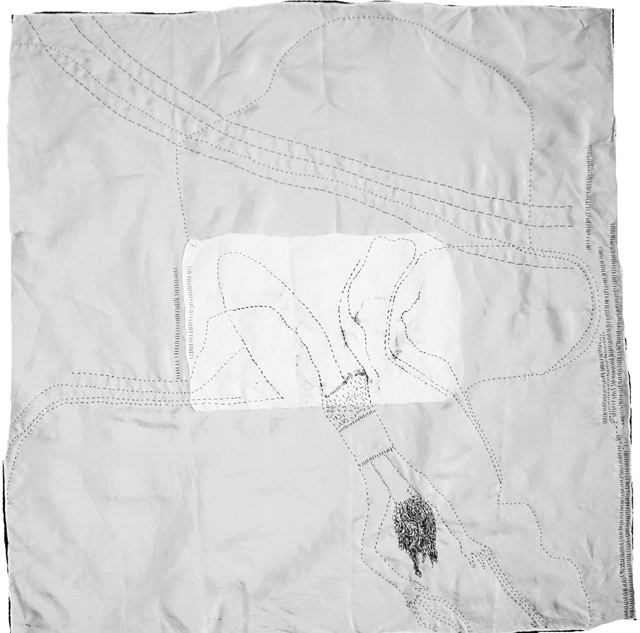 This next piece spanned two wars in Iraq. 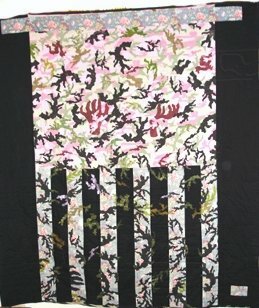 For the back of the quilt I made my own camo. 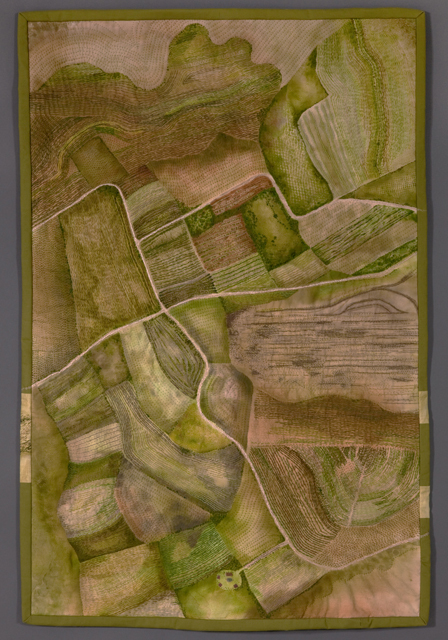 This next piece won me the Emerging Artist award at QUILT NATIONAL 2009 at The Dairy Barn in Athens, OH. It is about falling for various societal myths regarding Power, Fame, Beauty, Luck, Money, Love – the things we, as women, wish for; our great expectations. It includes tiny images from Mexican lottery cards, female celebrities from the entertainment section of the newspaper, and fruit from seed catalogues. Look at it and infer the psychological and political pressure put on today’s women. Rose swallowing involves a lot of physical and emotional preparation! 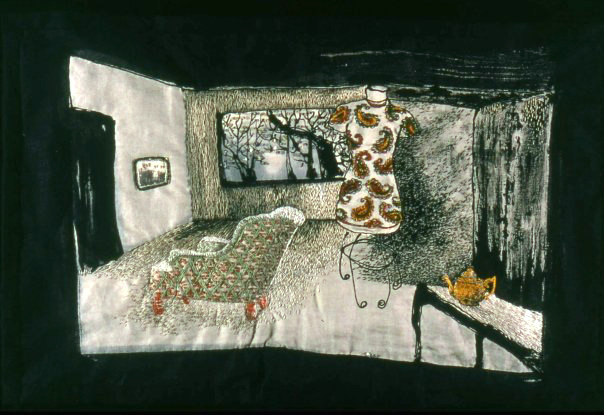 The little windows contain reverse appliqued images that were printed on fabric using the computer. 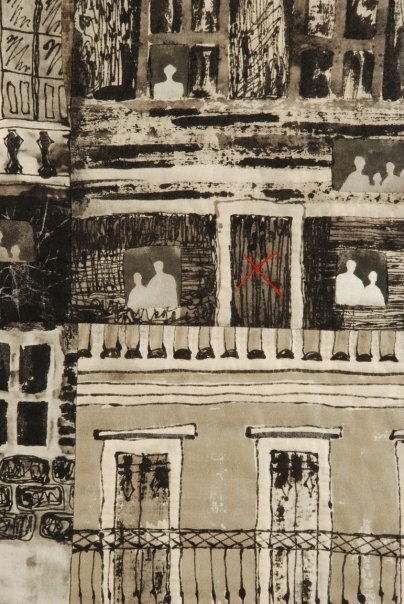 Other works that also use IMAGE TRANSFER onto cloth. . . 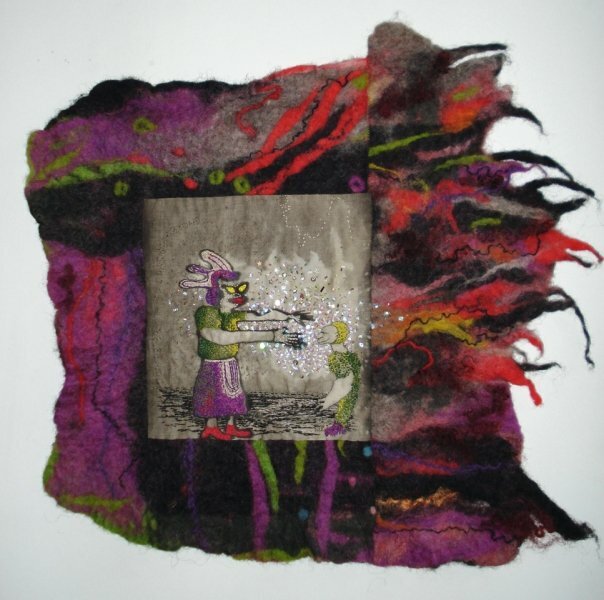 It has been said that creating art is a symptom of a psychological disorder. That may very well be. 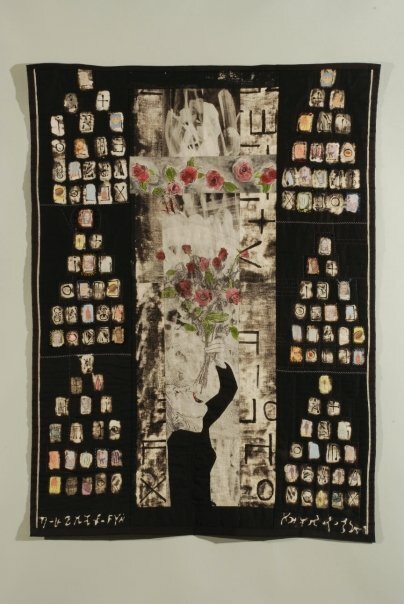 To me there is something compelling and attractive about the compulsive accumulation of thousands of marks made with a needle and single or double strands of colored thread. At the same time it is maddeningly slow. It is simultaneously meditative and boring. detail of petals. The originals were actual rose petals, but some galleries do not allow organic substances that can decay or spread mold or whatever. So I created these petals from paper pulp and colored them to look like the real thing. 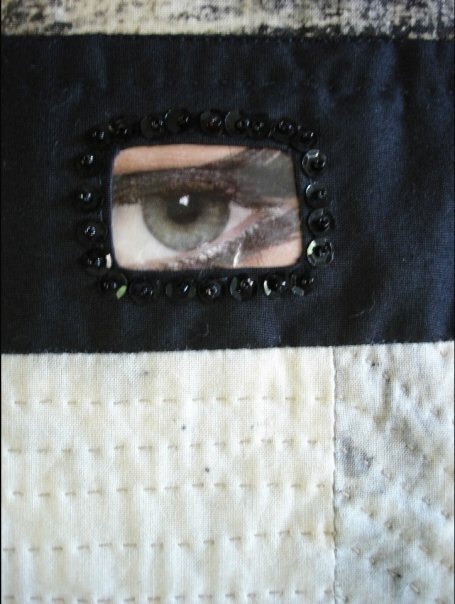 Love the “View” as I think that the need to “create” (wheather I am creating art is anyones opinion) may be a disorder. I know I can’t help myself- so maybe it’s an addiction too? Anyway, now you have me curious about “Can Opener”??? What are we women capable of? 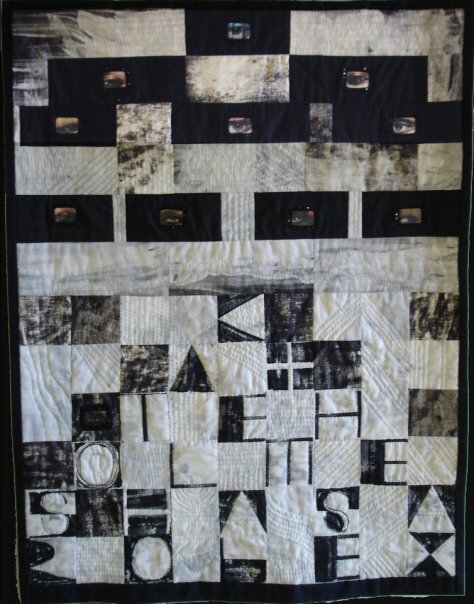 sue – these quilts are all so beautiful! i’m so taken by the rose petals – they look remarkably real. i’m also struck by the “pathos” piece – the details and the movement are astounding. you were really able to capture the unique, almost european quality of new orleans architecture – but also the idea of this great city floating in total chaos. i would love to see all these pieces in person one day! in other news i am about to start reading a book by a french author called “enough about love” – i will keep you updated about whether it’s any good! Natalie, thanks for looking at my work and for your comments. I like your take on the city floating in chaos, totally isolated like an island. It’s always exciting to hear what someone is able to ‘read’ in another’s artwork! I didn’t know you had this posted. I really enjoyed seeing all your work. Thanks, Pam. That’s my work in a nutshell !